Though Ryan Reynolds may not have had much success as a Hollywood leading man, with films like Green Lantern and R.I.P.D bombing hard – here’s hoping that the long-awaited Deadpool, now in production, can fix that – he’s making due progress as a strong actor in his own right, and with The Voices he reaches a comically dark peak that signals one of his strongest turns in years. Imagine Dexter if he was slightly more out-going and friendly, and you have a good visualisation of Jerry (Reynolds), a small-time factory worker whose crush on British accountant Fiona (Gemma Arterton) becomes unexpectedly murderous. Persuaded by his talking cat and dog, the Scottish-accented Mr. Whiskers and Southern baritone Bosco respectively (both also voiced by Reynolds), Jerry decides to go crazier from there on – and so does the movie, which becomes more uncomfortable with every revelation we discover about Jerry’s history with mental illness, including his inheriting it from his equally-disturbed mother and a traumatic incident which leads him to usual appointments with a court-appointed psychiatrist (Jacki Weaver). We know his actions are reprehensible, but the fact that he means well all throughout while remaining blissfully unaware of his reality – there’s a clever juxtaposition of how Jerry sees his clean and tidy apartment above an abandoned bowling alley, and how it really looks – still manages to make him sympathetic, no matter how low he sinks. Oddly enough, the film we paired this with most was Filth, and though James McAvoy didn’t portray someone as disturbed as a serial killer (though was certainly repugnant in his own right) it also presented a disturbing trip into a troubled man’s psyche which can be both fascinating and horrifying to watch at the same time. We’d even go so far to suggest it makes an unlikely yet surprisingly fitting double-bill. Going back to this movie, it is restrained enough to stay focused on Jerry’s damaged mental state and how it affects everything and everyone around him. The factory where he works, for example, has a distinct bubble-gum colour to certain things like his uniform, and given how he sees his own apartment different from how it really is you could argue that the same thing is happening here, and it feels all the more discomforting because of it. It is also a smart decision to have his talking pets also voiced by Reynolds, since it’s made clear very early on that they are indeed the titular voices that are haunting him, and they act as a sort of angel-and-devil conscience pairing when Jerry starts questioning what to do in the wake of his bloodthirsty actions. Even as he starts bringing home the heads of his victims and placing them in his fridge, they start talking to him in a very exaggerated manner that only he would imagine up – Arterton, as the unfortunate first victim (it’s not a spoiler, it’s in the trailer), speaks with a chipper and archetypal British accent as opposed to her snarky and even bitchy real self – and it’s all the more psychologically damaging when you understand the reality of the situation. Reynolds carries this film with a heartfelt and strong lead performance, his own cheery nature and happy-go-lucky attitude contrasting heavily with his psychopathic tendencies but he works off of both wonderfully. There is a true emotional depth to his performance that anyone else would have probably avoided and simply stuck to a more two-dimensional approach, but Reynolds truly believes in his character and instead turns in something more interesting and – dare we say it – likable with this otherwise repulsive person (on the outside, at least). He even gets a cute mini-romance with Anna Kendrick’s sweet colleague, which gives the film a relieving breather from the disturbing other elements of the film, but when it comes back it’s a sad but fitting reprise. 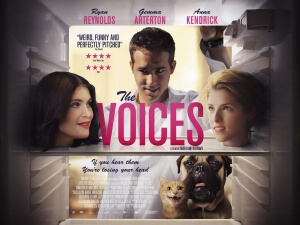 Some certainly won’t be taken by the film’s uncomfortably dark tone, but anyone else should consider The Voices to basically be Dexter if it were a traditional sitcom where his roommates are his talking pets – and yes, it is every bit as amusing as it sounds. The Voices is an intense and intriguing psychological horror-comedy that provides satisfaction in both areas, with Ryan Reynolds delivering a strong performance amidst the carnage.